The body produces approximately 1.5 litres of saliva every day, and it plays a vital role in lubricating food, digestion, and protecting the oral environment. The production and composition of saliva is under neural control – via the parasympathetic and sympathetic nervous systems. In this article, we shall look at the regulation of salivary production and its clinical correlations. Saliva is produced by the salivary glands of body – the parotid, submandibular and sublingual glands. 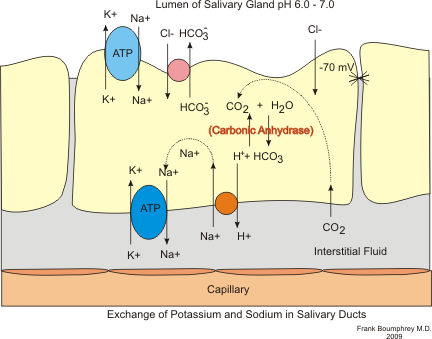 Within the glands, the acinar cells are responsible for the volume of saliva secreted, and the duct cells are responsible for the composition of saliva. Information on the secretion of saliva can be found here. Fig 1.0 – Diagram showing the modification of saliva. Saliva is produced and secreted by the salivary glands of the body. These glands are under the control of the autonomic nervous system, comprised of sympathetic and parasympathetic nerve fibres. The sympathetic control of salivary production is via the superior cervical ganglion. Sympathetic stimulation results in the release of noradrenaline, which acts upon alpha- and beta-adrenergic receptors. 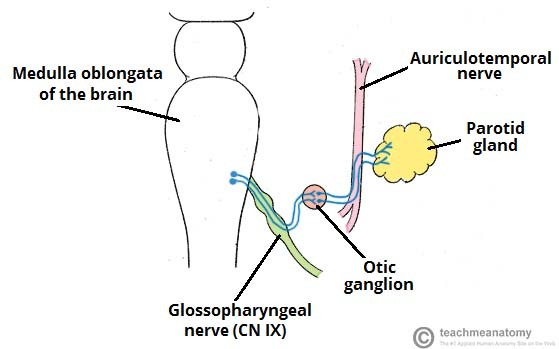 There is variable sympathetic innervation between the salivary glands. On the whole, this system is far less important than the parasympathetic innervation in terms of regulating production of saliva. The parasympathetic outflow is coordinated via centres in the medulla, and innervation occurs via the facial and glossopharyngeal nerves. Afferent information from the mouth, tongue, nose and conditioned reflexes are integrated within the brain – and in the presence of food, parasympathetic stimulation occurs. Overall, increased parasympathetic stimulation results in an increased flow of saliva that is more watery in composition. Fig 2 – Path of parasympathetic fibres to the parotid gland. Lack of swallowing – resulting in saliva pooling in the mouth. This is typically due to neuromuscular dysfunction such as cerebral palsy, Parkinson’s disease or Motor Neurone Disease. Increased secretion of saliva – which is typically due to medication. It is often noted within the treatment of Alzheimer’s disease or myasthenia gravis, as treatment of both conditions involves the use of anti-cholinesterases. The management depends on the cause, but typically involves treatment of any reversible factors. For example, drug regimes may need to be changed or even stopped depending on the severity. Behaviour modification may be necessary in terms of learning methods to help clear the pooled saliva. In more severe cases, anticholinergic medication can be used to reduce secretion of saliva – however, the use of this may be limited by side effects. Finally, if nothing else is successful; radiation, injection of botulinum toxin or surgery may be considered. Which of the following is an effect of the sympathetic nervous system on saliva production? What is the main post-ganglionic neurotransmitter in the sympathetic nervous system? Which of the following is an effect of the parasympathetic nervous system on saliva production? What is the main post-ganglionic neurotransmitter in the parasympathetic nervous system? Which drug class is useful in the treatment of sialorrhoea?